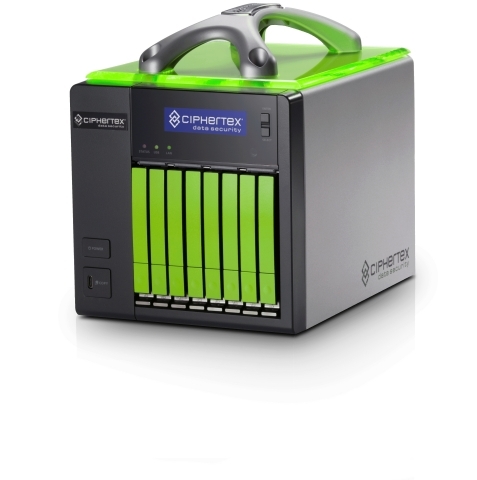 DALLAS--(BUSINESS WIRE)--Ciphertex Data Security, a leading data security solutions provider, today announced two new servers at the SuperComputing-18 Conference. The new Ciphertex NVMe 1U rackmount server provides 6X the data throughput of SATA and SAS, maximizing uptime for data migration and file transfers. The new Ciphertex portable SSD NAS server empowers the highest throughput, scalability and durability under server use conditions. Debuting at SC18 at booth #2606, both of these innovations increase productivity, save time and reduce costs. "We live in a world full of fear, and Ciphertex is working to provide protection and peace of mind,” said Jerry Kaner, President and CEO of Ciphertex. “We produce products that effectively combat those risks, while also delivering return on investment through productivity, speed and cost savings." The Ciphertex NVMe (CX-20K-REX NVMe) are ideal for high-performance computing environments, such as HPC Data Centers, government and military, aerospace, healthcare, oil and gas, 3D modeling, media and entertainment, financial institutions and automotive. Its high performance delivers exceptional IOPs (Inputs/Outputs per Second) and low latency not seen in earlier technologies, which makes it ideal for high-intensity database workloads, including high-security encryption data centers, cloud virtualization, virtual desktop infrastructure (VDI), 3D modeling, supercomputers and high-intensity applications. The 1U rackmount server storage capacity of 220TB enables scientists and engineers to generate and analyze data faster than ever before and easily scale to petabytes and even zetabytes. Researchers can tackle scientific problems of greater size and complexity at a fraction of the time and cost. The NVMe drive technology and improved performance greatly reduces the overhead of software data encryption. The Ciphertex CX-8KSD-NAS is a portable encrypted enterprise class NAS server designed for mission critical business applications, including network storage, backup, disaster recovery and virtualization. It delivers maximum performance for professionals working with heavy multimedia files because it houses eight enterprise-class 2.5” hard drives (HDD) or solid state drives (SSD) to store up to 88TB. With no moving parts and a shock-resistant internal frame, the CX-8KSD offers users peace of mind as it can withstand accidental drops. The AES 256 encryption ensures data protection that meets an often unpredictable demand – from workstations to the most taxing virtualized production environments. Designed for Macs and PCs with Thunderbolt™ 3 ports, the CX-8KSD allows users to enjoy speed performance in a lightweight and portable design. The server boasts the fastest maximum write speed of 2,300 MB/s in the industry, enabling users to transfer a 20GB-sized 4K UHD video in just 12 seconds. In addition, the Thunderbolt 3’s 40Gbps bandwidth enables up to four times faster data transfer than USB 3.0, as well as a read speed of up to 2,800 MB/s and 25.5 times faster than external HDDs. The Ciphertex CX-8KSD-NAS also comes with the option of dual 10 GbE ports that are available in copper, fiber or both. Both the Ciphertex CX-20K-REX NVMe and CX-8KSD-NAS will be available by the end of the year. They will be available online at www.ciphertex.com and select resellers. Ciphertex single drives, RAID systems, NAS servers, and rackmounts offer unparalleled performance, security and reliability – seamlessly integrating hardware-based AES 256-bit encryption with the latest in storage technologies and smart design. Ciphertex products are DoD environmental lab certified for reliability in harsh environments. For more information on Ciphertex, please visit www.ciphertex.com.